Those crazy hate-mongers at the Westboro Baptist Church are at it again. Famous for their picketing of military funerals, colleges, and even high schools, these are the folks that march around with picket signs contemptuously declaring that this entire country (except for them) is going to Hell because we tolerate homosexuality. Now, they’re targeting the funerals of the six victims of Saturday’s shooting in Tucson, Arizona. 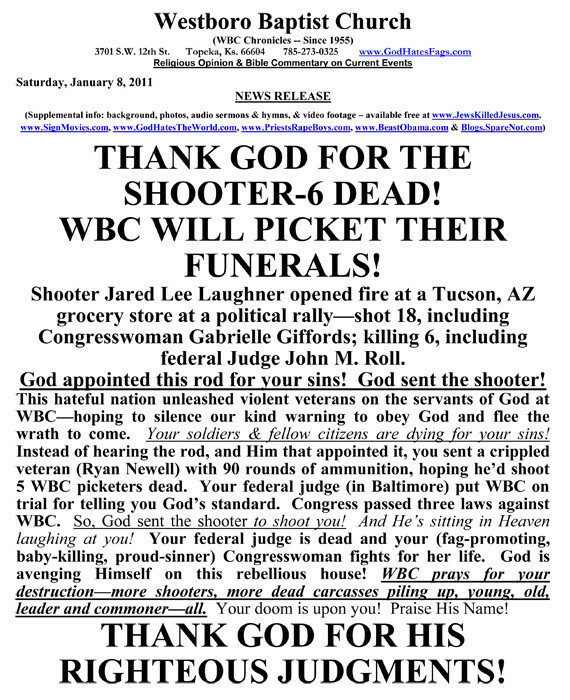 The controversial group wasted no time in gleefully announcing their intention to protest the funerals, rejoicing at the six fatalities and insisting that God sent the killer to enact vengeance on federal Judge John Roll, killed in the attacks, and the “fag-promoting, baby-killing, proud-sinner” congresswoman Rep. Gabrielle Giffords, who is still in critical condition after being shot in the head by Jared Lee Loughner. And of course, the WBC believes that God is in Heaven laughing at the murders right now. Every time I write about this group, I struggle with whether it would be better to just ignore them and hope that they will eventually fade into obscurity. But in the end, I often err with wanting to show just how dangerous religious-fueled persecution of the minority can be, in the hopes that more reasonable people will stop and consider their own beliefs on related subjects. My entire being is sickened by the mindless hatred that comes out of this so-called church, and I feel both loathing and pity for anyone who lives their life so full of venom. This entry was posted on Tuesday, January 11th, 2011 at 9:35 am and is filed under Uncategorized. You can follow any responses to this entry through the RSS 2.0 feed. You can leave a response, or trackback from your own site.